cools up to : 10 sqmt./107 sqft. cools up to : 10 sqmt. or 107 sqft. cools up to : 7.5 sqmt./80 sqft. cools up to : 28 sqmt./300 sqft. There are times when you need your cooler throw in air at higher scale. This is when tower air coolers come into use. 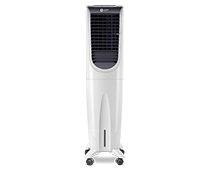 Designed in a sleek and compact package, the Orient Electric Tower Air Coolers throw air at a higher point as compared to other coolers. These are best used in kitchens where the use of air conditioners is not advisable and the cooling from a fan won’t suffice. 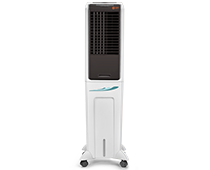 Since tower air coolers throw air at a higher point as compared to other coolers, their foremost benefit lies in their height because when you are standing straight, you want the air to be delivered above your waist and not below it. 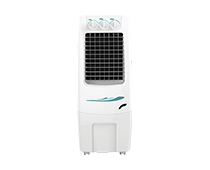 There are a total of 5 models available in our tower air coolers range from which you can choose one according to your needs. The Supercool series (except Supercool 3001H) as well as the AT series come with touch controls which not only make it easy for you to control the cooler but also add an aesthetic value to the unit. Each of our tower air coolers come with 4 castor wheels which make them easily portable. 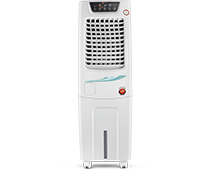 Now whether you are in your kitchen or in your bedroom, you can easily cool your space with Orient Electric Tower Air Coolers. With their easy touch controls, these coolers let you control the speed and the direction of the air coming out from them. Also, all the coolers in this range have an integrated water tank with an easy door which lets you refill the tank with easy. Some of our coolers in this range also come with auto fill tank. 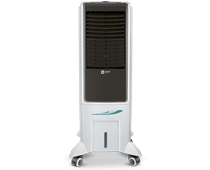 Like all our other smart products, our tower air coolers have been priced according to our consumers. We aim to offer the best features and performance in the best possible price. Orient Electric Tower Air Coolers offer the best value for money in terms of performance, longevity and build quality. 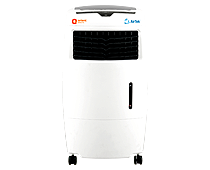 Their compact design enable them to fit in small spaces which let them operate as personal air coolers as well. This means that you do not need to purchase two coolers for two separate needs, just get the right Orient Electric Tower Air Cooler and all your cooling needs will be sorted.